The Class of 2013 will convene on the Emory Quadrangle Monday, May 13, at 8 a.m. to participate in Commencement exercises steeped in time-honored tradition. Emory Photo/Video. 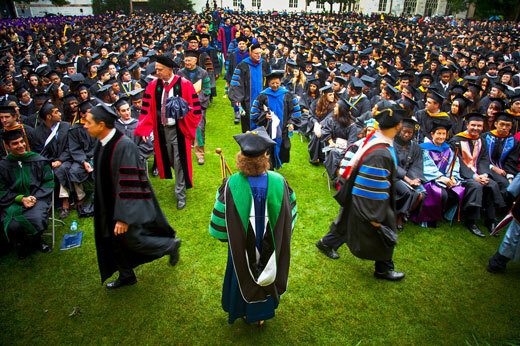 View Commencement photos, videos and stories on Twitter and Instagram by following @EmoryUniversity and using hashtag #Emory2013. Also stay connected with Facebook and the Emory Mobile App (text “EMORY” to 99699 for info). The enduring power of poetry, language and ideas will be highlighted at Emory's 168th Commencement ceremony this year, featuring a keynote address by former U.S. Poet Laureate and Pulitzer Prize-winner Rita Dove. The Class of 2013 will convene on the Emory Quadrangle Monday, May 13, at 8 a.m. to participate in Commencement exercises that are both steeped in time-honored tradition and enhanced with new, crowd-pleasing technology. This year, for the first time, guests will observe the procession of more than 4,200 graduates aided by remote-operated cameras and large LED video screens, installed alongside the central stage to provide "a close-up view" of the event, complete with live text captioning, says Michael Kloss, chief of protocol and executive director of the Office of University Events. A 44,000-square-foot tent — another first — will debut on McDonough Field, intended to offer overflow shelter for some 6,000 guests, who may also view the main ceremony remotely on a large video screen. While ceremonies will take place on the Quad even in the event of light "umbrella-friendly" rain, if heavier rain develops, elements of the central ceremony —including the keynote and presidential addresses and the awarding of honorary degrees — will be relocated to the new McDonough Field tent, Kloss says. An inclement weather schedule will be posted online by Sunday evening. A ritual of pageantry rooted in the Middle Ages, the ceremony is expected to attract a crowd of about 15,000 to witness the conferral of degrees upon a class that will be remembered for its resilience, says President James W. Wagner. The Class of 2013 arrived at Emory amid the depths of a global economic crisis, recalls Wagner: "Many of their families had to adjust expectations about what they could contribute to their education. Many of our students ended up working longer hours to support themselves." "But these students also showed great responsiveness to other people's needs, whether it was the tsunami in Japan or the earthquake in Haiti," he adds. "They are tough and creative and compassionate and determined, and all of that shows in their resilience." Class members will also be recalled for their passion for community engagement and "the courage to raise questions about the institution" during some challenging years, says Gary Hauk, vice president and deputy to the University president. "At the same time, they've been very committed to the University through leadership — very much engaged in work on campus and involved in important conversations about the place of the liberal arts at Emory," Hauk notes. Discovering resolve through difficult times can prove an education in itself, says Bobbi Patterson, professor of pedagogy in the Department of Religion, who will lead this year's graduate procession as Emory's first female chief marshal of the University. "It draws us into the deepest well of who we're going to be," she explains. "This is a class that made choices to participate — often strongly — for the causes they believed were of value." Patterson also finds the class distinguished by "very innovative, creative, interdisciplinary scholarship," she adds. "I see them as hopeful, with a very bright outlook for the future." Dove's appearance as this year's keynote speaker represents something of a homecoming for the renowned poet. In 2011, the Commonwealth Professor of English at the University of Virginia in Charlottesville came to Emory for a residency during Women's History Month. During Commencement, she will receive an honorary doctor of letters degree. Hauk finds her selection especially fitting, given the prominent role of poetry on campus — from the contributions of current U.S. Poet Laureate Natasha Trethewey, who heads Emory's acclaimed Creative Writing Program, to the Raymond Danowski Poetry Library, a collection of rare and first edition poetry curated through Emory's Manuscript, Archives and Rare Book Library (MARBL). A speaker who embodies the potent eloquence of language and shared ideas is a good match for the Class of 2013, agrees Michael David Harris, a senior in philosophy who as the Emory College class orator will speak as "a proud humanities major." "What's been important to me is being around people who feel their education is a major step in a process not only toward finding a job, but finding a fulfilling life," explains Harris. "This has been a hard year for Emory," he acknowledges. "This class was exposed to a lot of change, forcing us to imagine what we want Emory to be and to articulate it." "From the outside, it may not look ideal, but I think our class has overcome that," Harris adds. "We got on the boat during a storm, but missed the hurricane." For information on Commencement events, including plans for individual school ceremonies, visit www.emory.edu/commencement. Can't attend the ceremony? The 168th Commencement exercises will be streamed live online at www.emory.edu/commencement/webcast. Emory Provost Claire Sterk will give the keynote address during Commencement exercises for about 343 graduates at Oxford College on Saturday, May 11. Sterk assumed duties as provost on Feb. 1. Prior to her appointment, she was senior vice-provost for academic affairs, where she oversaw development of academic and research programs at the University. A member of the Emory faculty since 1995, Sterk was appointed Charles Howard Candler Professor of Public Health in 2000. Oxford Commencement begins at 10 a.m., when a bagpiper leads the procession onto the Oxford College Green. A reception will follow on the lawn at Haygood Hall. Oxford College's ceremony recognizes students who have completed their sophomore year in preparation for continuing on to Emory's Atlanta campus.